Refreshing, packed with whole foods, a little booze and a touch of sugar, this white rum cocktail is simple to make. 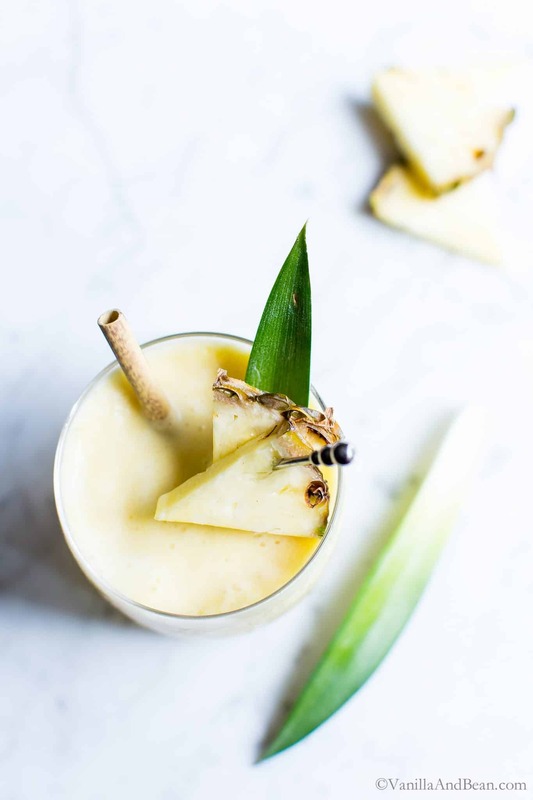 Have a taste of the tropics with this Fresh Pina Colada! vegan + gluten free *this post was updated with new photos, text and added recipe notes. Before we get to this white rum cocktail, a little back story. Traveling has a way with vivid reminders of how we’re interconnected with people, land and the wild things. Whether it’s simply traveling 100 miles away from home or across the globe, I’m always interested in culture, food and ecology and how these things interact on a local and global scale. Food is interesting to me especially from the standpoint of farming practices. Our guide shared that Costa Rica is one of the top exporters of pineapples worldwide, currently. He also explained one pineapple plant takes over a year to produce one pineapple fruit when grown organically. However, multinational corporations conventionally grow a pineapple in six months by applying agrochemicals. These production practices allow for increased crop yields in a shorter period of time. But as progressive as Costa Rica is, they struggle with issues as any nation does. I couldn’t help but think about how like the US, they too have people living in the margins. Workers, some immigrant, who endure harsh working conditions, low wages and exposure to toxic chemicals to put food on our tables. And as a consumer I have a choice every time I spend a dollar at the store, or opt to buy through community supported agriculture or at the farmers market. Because every dollar I spend on food is a vote for farming practices, sustainable or not. Pineapple is simply one example. So, I avoid the BOGO and enjoy the single succulent pineapple that tastes sweeter, is slightly more expensive and juicier anyway. If I can’t find a fresh organically grown pineapple, I go without and look for canned (organic) or opt for locally grown fruit when in season. Look for fresh organic pineapple. The texture and flavor are worth the effort. If out of season, look for organic canned and juice pineapple. Only one of the three stores I shop at carry organic canned, so it can be hard to find unless purchased online. I like Native Forest for chunks and crushed and Lakewood for juice (simply use the juice in the canned pineapple if making one batch). If carving a fresh pineapple and you’re into smoothies, don’t throw out the core! It blitzes up beautifully in a high speed blender. Toss it in the freezer until ready to use. 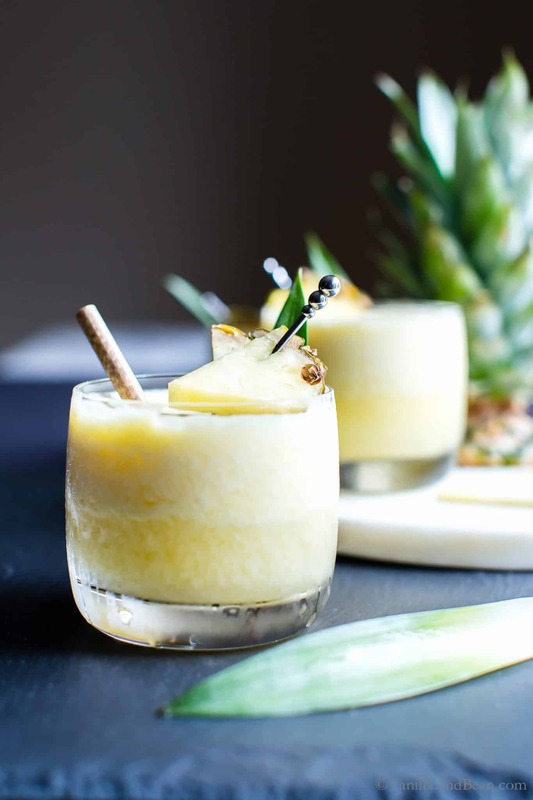 For an extra frosty homemade fresh pina colada delight, freeze the pineapple chunks before blending. For the coconut creme, I use a can of full fat coconut milk, refrigerated, then I scoop out the solid coconut cream needed for the recipe. Because sweetness of pineapple varies, taste before adding sugar then adjust to taste. Fresh Pina Coladas are fabulous as mocktails. Simply leave the rum out and add more pineapple and/or coconut cream! For information on how pineapples are grown in Costa Rica see Bitter Fruit; The Truth About Pineapple Production, and Global Issues; Pineapple . In a high speed blender, add the pineapple chunks, juice, coconut creme, rum, sugar and ice. Blend on high speed until the mixture is smooth yet still icy cold. Taste for sugar adjustment if needed. 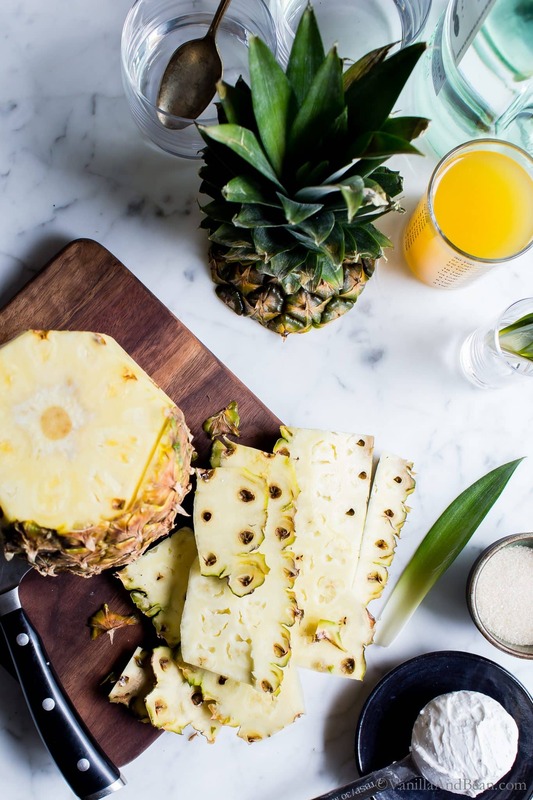 Pour into serving glasses and garnish with fresh pineapple. Serving size: If serving in low ball glasses, I can get three servings out of this batch. If serving in a high ball, two servings. Adjust the rum according to serving size. Fresh Pina Coladas are fabulous as mocktails. Simply leave the rum out and add a few more chunks of pineapple and/or one tablespoon of coconut cream! *If using fresh cut pineapple chunks measure out almost two cups(245g). Because the chunks are hand cut, rather from a machine like canned, they will be odd shaped and probably larger in size. **For the coconut creme, I use a can of full fat coconut milk, refrigerated, then I scoop out the solid coconut cream needed for the recipe. ***The amount of added sugar can be adjusted up or down depending on the sweetness of the pineapple. Sometimes I add more, sometimes less. Always such a great message behind your posts, Traci. I feel the same way about supporting local and organic produce. There are so many aspects to consider and the workers are one of the most important! I’m happy to hear Costa Rica is making so many strides to protect the environment. It’s a place I have wanted to visit for a long time and hope to be able to do so one day. Until then I will have to dream of it whilst drinking these gorgeous pina coladas! They look so refreshing and flavorful. Thank you Sarah… I know these are important considerations for you as well and I appreciate your efforts! You must go to Costa Rica – you will absolutely love it. And there are plenty of fresh Pina Coladas to be had! Great post. I could not agree more……..Costa Rica has been on my list of places to visit. I will get there one day. Keep those awesome recipes coming. They give me renewed inspiration and enthusiasm for cooking. Thank you for your kind words, Sue. So appreciated :D And you WILL get to Costa Rica. Pure magic there and so much to take away from what they value in their culture. I hope you enjoy this refreshing sipper! 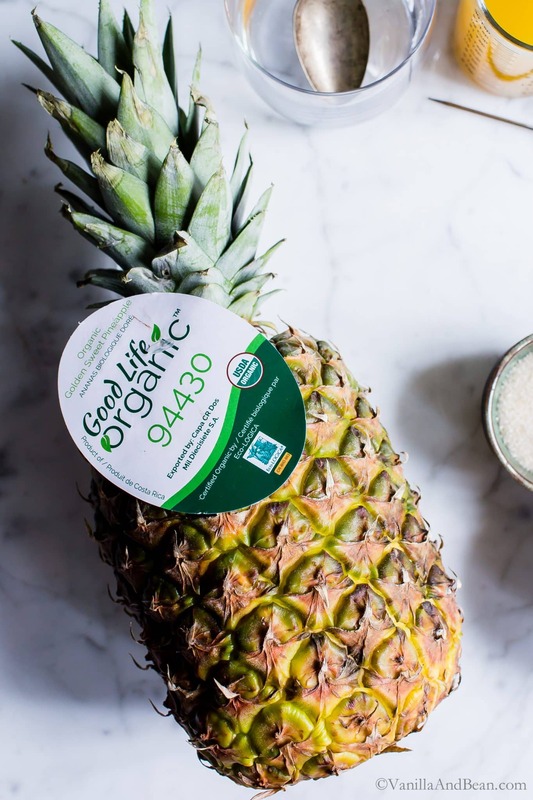 what a great post, and plethora of information on organic pineapples. I will be mindful as well now. who knew it takes one year to grow one pineapple. I hate the way the world is going with producing more of any food now a days. very disheartening. Love these new photos, Traci! We’re about to get a serious heat wave here in LA so this will need to be on the menu this weekend! Or it would make a great Fourth of July drink – I can enjoy it while I’m trapped at home trying to keep my dog calm from the fireworks! This truly is one of my favorite drinks ever. Absolutely loving the new pictures and of course I adore your passion for food and it’s resources. This looks like the most amazing grown-up smoothie! I went to Jamaica years ago and felt like I’d tasted pineapple (and rum!) for the first time. Such a perfect combo. This is one gorgeous summer drink, Traci! I bet it tastes light and fresh unlike some of the ones I’ve tried at various places haha. Love the new photos, Traci! Looks and sounds amazing. And thanks for all the information on pineapples. I never knew it took so long to grow just one! Wow! As usual, I not only get a delicious recipe here at V&B, but I also learn something! Thanks for sharing this delicious, perfect for summer cocktail Traci and all the important info on Costa Rica! Hope you and Rob enjoy the 4th! YUM! I LOVE pina coladas. :) We are going to the Bahamas starting next weekend and I’m so making these down there! Looks amazing! This looks so delicious! I love pina coladas, but hate the mix! Traci, this is so beautiful! And yes, humming the pina colada song right now. I am all about holding onto summer as long as possible. Truly not ready for it to end. Enjoy your much deserved break! xo. This recipe looks so refreshing and summery! Traci, I have never seen a more beautiful pina colada! Enjoy your time off. Cheers! i will definitely be singing the pina colada song in my head all night now! :) this looks so fresh and tasty, a far cry from the pre-mixed versions they serve at bars that just don’t give this special drink justice. but you sure did. :) cheers to a few more warm summer nights! “This recipe is a bit of a push back to the encroachment of commercialism surrounding Fall’s holiday season.” Hahaha, I LOVE that line, Traci! You’re so right. Why should we care about Halloween right now? And more to the point, why are people stocking up on the candy when we all know that it will just melt in the summer heat. I love sipping on pina coladas, but I’ve never tried making one at home before. Definitely will have to get on that soon. Hope you enjoy your blogging break, my dear! How lovely and refreshing. I can certainly see how this drink would contribute to a fun and festive holiday feeling. I hope you’re having a great week Traci! Thinking of you. my favorite summer cocktail here with no crazy ingredients, love it, Pinning! Thank you Beeta, for your encouragement and sweet words! No doubt it still feels like Summer… but I can tell, the days are getting shorter and the nights a bit cooler (a welcome change!). Fall is my favorite too! But I’ll still be sippin on Pina Colada for many more weeks to come! Here’s to a blogging break, Traci! Well deserved and I hope you get fully relaxed and recharged on your time off. It’s in the 90s here so I’m not thinking about fall at all. So in the spirit of summer I’m looking forward to trying this drink. Can’t wait – especially since I’m a big pineapple fan. Enjoy the rest of your summer, Traci! Hooray for breaks and mini vaca! Recharged, indeed. It’s still a bit warm here too… so I’m still chuggin cold drinks and popsicles! I hope you get some relief soon, Geraldine! 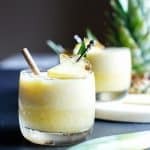 I’m definitely making this pina colada for the weekend! Great idea Traci! Love it! I went to Hobby Lobby last week, and they already have CHRISTMAS STUFF OUT! Umm, hello? It’s August. I couldn’t believe it. I’m going to save the last of summer. Starting with this super tasty looking pina coladas. Love how fresh they are. And now that song is definitely stuck in my head, haha! I’m singing! I’m singing!! 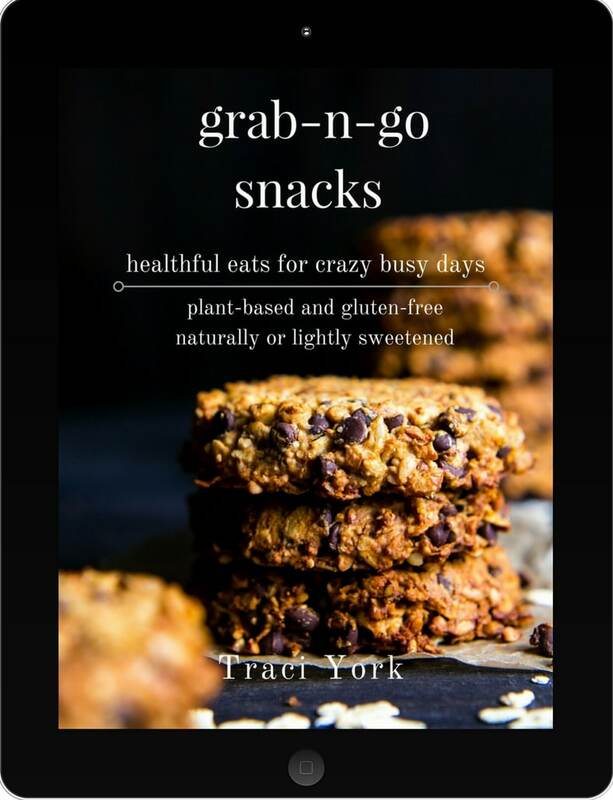 These sound delish Traci and your photos are amazing! That pineapple! GORGEOUS! Enjoy your time off. RELAX! I hear you Mary Ann!! :D I’m with ya! I am all about still enjoying summer. These are fantastic. I know I can definitely get my summer on with these! Yes, I AM singing it! Enjoy your blogging break, and can’t wait to see you back here in a few weeks for some killer fall recipes! I’m with you girl – I still want to enjoy the rest of summer! I’m making a no pumpkin rule until mid September haha. 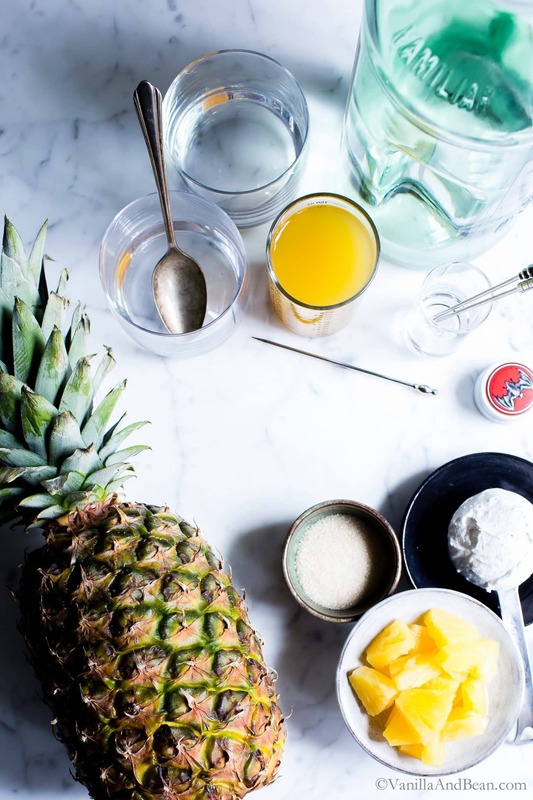 I’ve never made my own pina colada at home, but this recipe makes me want to. Such a perfect drink for sipping while soaking up the rays. I like your no pumpkin rule… I may hold out till October, unless our pumpkins come in earlier here.